Advanced Super-Eutectic Recording (Advanced SERL) technology offers superior durability and reliability at higher rewrite speeds. Versatile, high-capacity media is perfect for personal data storage, multimedia presentations, temporary storage of Internet downloads, sharing files, and more. 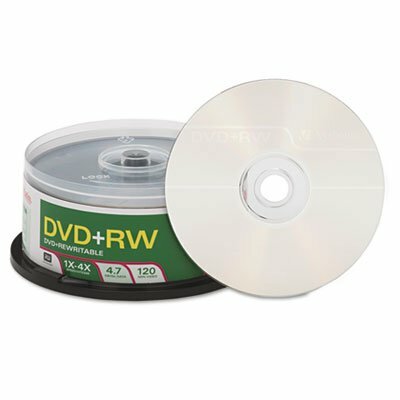 Durable disc features superior archival life and can be rewritten up to 1,000 times. Compatible with most DVD-ROM drives and DVD players for hassle-free writing and reading. Durable with superior archival life. Compatible with most DVD-ROM drives and DVD players. View More In DVD+RW Discs.